1Mac 1:3 And went through to the ends of the earth, and took spoils of many nations, insomuch that the earth was quiet before him; whereupon he was exalted and his heart was lifted up. 1Mac 1:4 And he gathered a mighty strong host and ruled over countries, and nations, and kings, who became tributaries unto him. 1Mac 1:5 And after these things he fell sick, and perceived that he should die. 1Mac 1:6 Wherefore he called his servants, such as were honourable, and had been brought up with him from his youth, and parted his kingdom among them, while he was yet alive. 1Mac 1:7 So Alexander reigned twelves years, and then died. 1Mac 1:8 And his servants bare rule every one in his place. 1Mac 1:9 And after his death they all put crowns upon themselves; so did their sons after them many years: and evils were multiplied in the earth. 1Mac 1:10 And there came out of them a wicked root Antiochus surnamed Epiphanes, son of Antiochus the king, who had been an hostage at Rome, and he reigned in the hundred and thirty and seventh year of the kingdom of the Greeks. 1Mac 1:11 In those days went there out of Israel wicked men, who persuaded many, saying, Let us go and make a covenant with the heathen that are round about us: for since we departed from them we have had much sorrow. 1Mac 1:12 So this device pleased them well. 1Mac 1:15 And made themselves uncircumcised, and forsook the holy covenant, and joined themselves to the heathen, and were sold to do mischief. 1Mac 1:16 Now when the kingdom was established before Antiochus, he thought to reign over Egypt that he might have the dominion of two realms. 1Mac 1:18 And made war against Ptolemee king of Egypt: but Ptolemee was afraid of him, and fled; and many were wounded to death. 1Mac 1:19 Thus they got the strong cities in the land of Egypt and he took the spoils thereof. 1Mac 1:22 And the table of the shewbread, and the pouring vessels, and the vials. and the censers of gold, and the veil, and the crown, and the golden ornaments that were before the temple, all which he pulled off. 1Mac 1:23 He took also the silver and the gold, and the precious vessels: also he took the hidden treasures which he found. 1Mac 1:24 And when he had taken all away, he went into his own land, having made a great massacre, and spoken very proudly. 1Mac 1:26 So that the princes and elders mourned, the virgins and young men were made feeble, and the beauty of women was changed. 1Mac 1:28 The land also was moved for the inhabitants thereof, and all the house of Jacob was covered with confusion. 1Mac 1:30 And spake peaceable words unto them, but all was deceit: for when they had given him credence, he fell suddenly upon the city, and smote it very sore, and destroyed much people of Israel. 1Mac 1:31 And when he had taken the spoils of the city, he set it on fire, and pulled down the houses and walls thereof on every side. 1Mac 1:32 But the women and children took they captive, and possessed the cattle. 1Mac 1:33 Then builded they the city of David with a great and strong wall, and with mighty towers, and made it a strong hold for them. 1Mac 1:34 And they put therein a sinful nation, wicked men, and fortified themselves therein. 1Mac 1:36 For it was a place to lie in wait against the sanctuary, and an evil adversary to Israel. 1Mac 1:38 Insomuch that the inhabitants of Jerusalem fled because of them: whereupon the city was made an habitation of strangers, and became strange to those that were born in her; and her own children left her. 1Mac 1:39 Her sanctuary was laid waste like a wilderness, her feasts were turned into mourning, her sabbaths into reproach her honour into contempt. 1Mac 1:40 As had been her glory, so was her dishonour increased, and her excellency was turned into mourning. 1Mac 1:42 And every one should leave his laws: so all the heathen agreed according to the commandment of the king. 1Mac 1:43 Yea, many also of the Israelites consented to his religion, and sacrificed unto idols, and profaned the sabbath. 1Mac 1:49 To the end they might forget the law, and change all the ordinances. 1Mac 1:50 And whosoever would not do according to the commandment of the king, he said, he should die. 1Mac 1:51 In the selfsame manner wrote he to his whole kingdom, and appointed overseers over all the people, commanding the cities of Juda to sacrifice, city by city. 1Mac 1:53 And drove the Israelites into secret places, even wheresoever they could flee for succour. 1Mac 1:55 And burnt incense at the doors of their houses, and in the streets. 1Mac 1:56 And when they had rent in pieces the books of the law which they found, they burnt them with fire. 1Mac 1:57 And whosoever was found with any the book of the testament, or if any committed to the law, the king's commandment was, that they should put him to death. 1Mac 1:58 Thus did they by their authority unto the Israelites every month, to as many as were found in the cities. 1Mac 1:59 Now the five and twentieth day of the month they did sacrifice upon the idol altar, which was upon the altar of God. 1Mac 1:60 At which time according to the commandment they put to death certain women, that had caused their children to be circumcised. 1Mac 1:61 And they hanged the infants about their necks, and rifled their houses, and slew them that had circumcised them. 1Mac 1:62 Howbeit many in Israel were fully resolved and confirmed in themselves not to eat any unclean thing. 1Mac 1:63 Wherefore the rather to die, that they might not be defiled with meats, and that they might not profane the holy covenant: so then they died. 1Mac 1:64 And there was very great wrath upon Israel. 1Mac 2:1 In those days arose Mattathias the son of John, the son of Simeon, a priest of the sons of Joarib, from Jerusalem, and dwelt in Modin. 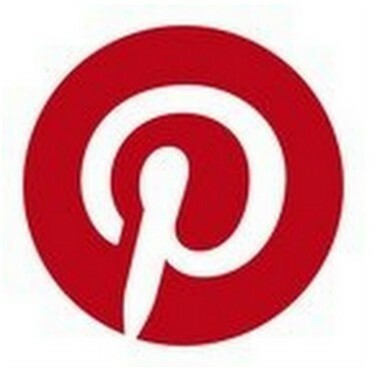 1Mac 2:5 Eleazar, called Avaran: and Jonathan, whose surname was Apphus. 1Mac 2:7 He said, Woe is me! wherefore was I born to see this misery of my people, and of the holy city, and to dwell there, when it was delivered into the hand of the enemy, and the sanctuary into the hand of strangers? 1Mac 2:8 Her temple is become as a man without glory. 1Mac 2:9 Her glorious vessels are carried away into captivity, her infants are slain in the streets, her young men with the sword of the enemy. 1Mac 2:10 What nation hath not had a part in her kingdom and gotten of her spoils? 1Mac 2:11 All her ornaments are taken away; of a free woman she is become a bondslave. 1Mac 2:12 And, behold, our sanctuary, even our beauty and our glory, is laid waste, and the Gentiles have profaned it. 1Mac 2:13 To what end therefore shall we live any longer? 1Mac 2:14 Then Mattathias and his sons rent their clothes, and put on sackcloth, and mourned very sore. 1Mac 2:15 In the mean while the king's officers, such as compelled the people to revolt, came into the city Modin, to make them sacrifice. 1Mac 2:16 And when many of Israel came unto them, Mattathias also and his sons came together. 1Mac 2:18 Now therefore come thou first, and fulfil the king's commandment, like as all the heathen have done, yea, and the men of Juda also, and such as remain at Jerusalem: so shalt thou and thy house be in the number of the king's friends, and thou and thy children shall be honoured with silver and gold, and many rewards. 1Mac 2:20 Yet will I and my sons and my brethren walk in the covenant of our fathers. 1Mac 2:21 God forbid that we should forsake the law and the ordinances. 1Mac 2:22 We will not hearken to the king's words, to go from our religion, either on the right hand, or the left. 1Mac 2:23 Now when he had left speaking these words, there came one of the Jews in the sight of all to sacrifice on the altar which was at Modin, according to the king's commandment. 1Mac 2:24 Which thing when Mattathias saw, he was inflamed with zeal, and his reins trembled, neither could he forbear to shew his anger according to judgment: wherefore he ran, and slew him upon the altar. 1Mac 2:25 Also the king's commissioner, who compelled men to sacrifice, he killed at that time, and the altar he pulled down. 1Mac 2:26 Thus dealt he zealously for the law of God like as Phinees did unto Zambri the son of Salom. 1Mac 2:27 And Mattathias cried throughout the city with a loud voice, saying, Whosoever is zealous of the law, and maintaineth the covenant, let him follow me. 1Mac 2:28 So he and his sons fled into the mountains, and left all that ever they had in the city. 1Mac 2:30 Both they, and their children, and their wives; and their cattle; because afflictions increased sore upon them. 1Mac 2:32 They pursued after them a great number, and having overtaken them, they camped against them, and made war against them on the sabbath day. 1Mac 2:33 And they said unto them, Let that which ye have done hitherto suffice; come forth, and do according to the commandment of the king, and ye shall live. 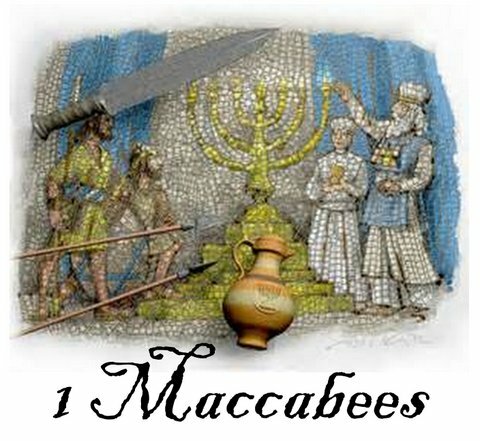 1Mac 2:34 But they said, We will not come forth, neither will we do the king's commandment, to profane the sabbath day. 1Mac 2:35 So then they gave them the battle with all speed. 1Mac 2:37 But said, Let us die all in our innocency: heaven and earth will testify for us, that ye put us to death wrongfully. 1Mac 2:38 So they rose up against them in battle on the sabbath, and they slew them, with their wives and children and their cattle, to the number of a thousand people. 1Mac 2:39 Now when Mattathias and his friends understood hereof, they mourned for them right sore. 1Mac 2:40 And one of them said to another, If we all do as our brethren have done, and fight not for our lives and laws against the heathen, they will now quickly root us out of the earth. 1Mac 2:41 At that time therefore they decreed, saying, Whosoever shall come to make battle with us on the sabbath day, we will fight against him; neither will we die all, as our brethren that were murdered im the secret places. 1Mac 2:42 Then came there unto him a company of Assideans who were mighty men of Israel, even all such as were voluntarily devoted unto the law. 1Mac 2:43 Also all they that fled for persecution joined themselves unto them, and were a stay unto them. 1Mac 2:44 So they joined their forces, and smote sinful men in their anger, and wicked men in their wrath: but the rest fled to the heathen for succour. 1Mac 2:46 And what children soever they found within the coast of Israel uncircumcised, those they circumcised valiantly. 1Mac 2:47 They pursued also after the proud men, and the work prospered in their hand. 1Mac 2:48 So they recovered the law out of the hand of the Gentiles, and out of the hand of kings, neither suffered they the sinner to triumph. 1Mac 2:50 Now therefore, my sons, be ye zealous for the law, and give your lives for the covenant of your fathers. 1Mac 2:51 Call to remembrance what acts our fathers did in their time; so shall ye receive great honour and an everlasting name. 1Mac 2:52 Was not Abraham found faithful in temptation, and it was imputed unto him for righteousness? 1Mac 2:53 Joseph in the time of his distress kept the commandment and was made lord of Egypt. 1Mac 2:54 Phinees our father in being zealous and fervent obtained the covenant of an everlasting priesthood. 1Mac 2:55 Jesus for fulfilling the word was made a judge in Israel. 1Mac 2:56 Caleb for bearing witness before the congregation received the heritage of the land. 1Mac 2:57 David for being merciful possessed the throne of an everlasting kingdom. 1Mac 2:58 Elias for being zealous and fervent for the law was taken up into heaven. 1Mac 2:59 Ananias, Azarias, and Misael, by believing were saved out of the flame. 1Mac 2:60 Daniel for his innocency was delivered from the mouth of lions. 1Mac 2:61 And thus consider ye throughout all ages, that none that put their trust in him shall be overcome. 1Mac 2:62 Fear not then the words of a sinful man: for his glory shall be dung and worms. 1Mac 2:63 To day he shall be lifted up and to morrow he shall not be found, because he is returned into his dust, and his thought is come to nothing. 1Mac 2:64 Wherefore, ye my sons, be valiant and shew yourselves men in the behalf of the law; for by it shall ye obtain glory. 1Mac 2:65 And behold, I know that your brother Simon is a man of counsel, give ear unto him alway: he shall be a father unto you. 1Mac 2:66 As for Judas Maccabeus, he hath been mighty and strong, even from his youth up: let him be your captain, and fight the battle of the people. 1Mac 2:67 Take also unto you all those that observe the law, and avenge ye the wrong of your people. 1Mac 2:68 Recompense fully the heathen, and take heed to the commandments of the law. 1Mac 2:69 So he blessed them, and was gathered to his fathers. 1Mac 2:70 And he died in the hundred forty and sixth year, and his sons buried him in the sepulchres of his fathers at Modin, and all Israel made great lamentation for him. 1Mac 3:1 Then his son Judas, called Maccabeus, rose up in his stead. 1Mac 3:2 And all his brethren helped him, and so did all they that held with his father, and they fought with cheerfulness the battle of Israel. 1Mac 3:3 So he gat his people great honour, and put on a breastplate as a giant, and girt his warlike harness about him, and he made battles, protecting the host with his sword. 1Mac 3:4 In his acts he was like a lion, and like a lion's whelp roaring for his prey. 1Mac 3:5 For He pursued the wicked, and sought them out, and burnt up those that vexed his people. 1Mac 3:6 Wherefore the wicked shrunk for fear of him, and all the workers of iniquity were troubled, because salvation prospered in his hand. 1Mac 3:7 He grieved also many kings, and made Jacob glad with his acts, and his memorial is blessed for ever. 1Mac 3:9 So that he was renowned unto the utmost part of the earth, and he received unto him such as were ready to perish. 1Mac 3:10 Then Apollonius gathered the Gentiles together, and a great host out of Samaria, to fight against Israel. 1Mac 3:11 Which thing when Judas perceived, he went forth to meet him, and so he smote him, and slew him: many also fell down slain, but the rest fled. 1Mac 3:12 Wherefore Judas took their spoils, and Apollonius' sword also, and therewith he fought all his life long. 1Mac 3:14 He said, I will get me a name and honour in the kingdom; for I will go fight with Judas and them that are with him, who despise the king's commandment. 1Mac 3:15 So he made him ready to go up, and there went with him a mighty host of the ungodly to help him, and to be avenged of the children of Israel. 1Mac 3:17 Who, when they saw the host coming to meet them, said unto Judas, How shall we be able, being so few, to fight against so great a multitude and so strong, seeing we are ready to faint with fasting all this day? 1Mac 3:19 For the victory of battle standeth not in the multitude of an host; but strength cometh from heaven. 1Mac 3:21 But we fight for our lives and our laws. 1Mac 3:22 Wherefore the Lord himself will overthrow them before our face: and as for you, be ye not afraid of them. 1Mac 3:23 Now as soon as he had left off speaking, he leapt suddenly upon them, and so Seron and his host was overthrown before him. 1Mac 3:24 And they pursued them from the going down of Bethhoron unto the plain, where were slain about eight hundred men of them; and the residue fled into the land of the Philistines. 1Mac 3:26 Insomuch as his fame came unto the king, and all nations talked of the battles of Judas. 1Mac 3:27 Now when king Antiochus heard these things, he was full of indignation: wherefore he sent and gathered together all the forces of his realm, even a very strong army. 1Mac 3:28 He opened also his treasure, and gave his soldiers pay for a year, commanding them to be ready whensoever he should need them. 1Mac 3:30 He feared that he should not be able to bear the charges any longer, nor to have such gifts to give so liberally as he did before: for he had abounded above the kings that were before him. 1Mac 3:31 Wherefore, being greatly perplexed in his mind, he determined to go into Persia, there to take the tributes of the countries, and to gather much money. 1Mac 3:33 And to bring up his son Antiochus, until he came again. 1Mac 3:36 And that he should place strangers in all their quarters, and divide their land by lot. 1Mac 3:37 So the king took the half of the forces that remained, and departed from Antioch, his royal city, the hundred forty and seventh year; and having passed the river Euphrates, he went through the high countries. 1Mac 3:39 And with them he sent forty thousand footmen, and seven thousand horsemen, to go into the land of Juda, and to destroy it, as the king commanded. 1Mac 3:40 So they went forth with all their power, and came and pitched by Emmaus in the plain country. 1Mac 3:41 And the merchants of the country, hearing the fame of them, took silver and gold very much, with servants, and came into the camp to buy the children of Israel for slaves: a power also of Syria and of the land of the Philistines joined themselves unto them. 1Mac 3:43 They said one to another, Let us restore the decayed fortune of our people, and let us fight for our people and the sanctuary. 1Mac 3:44 Then was the congregation gathered together, that they might be ready for battle, and that they might pray, and ask mercy and compassion. 1Mac 3:45 Now Jerusalem lay void as a wilderness, there was none of her children that went in or out: the sanctuary also was trodden down, and aliens kept the strong hold; the heathen had their habitation in that place; and joy was taken from Jacob, and the pipe with the harp ceased. 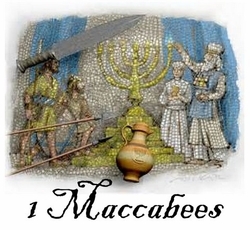 1Mac 3:46 Wherefore the Israelites assembled themselves together, and came to Maspha, over against Jerusalem; for in Maspha was the place where they prayed aforetime in Israel. 1Mac 3:48 And laid open the book of the law, wherein the heathen had sought to paint the likeness of their images. 1Mac 3:49 They brought also the priests' garments, and the firstfruits, and the tithes: and the Nazarites they stirred up, who had accomplished their days. 1Mac 3:50 Then cried they with a loud voice toward heaven, saying, What shall we do with these, and whither shall we carry them away? 1Mac 3:51 For thy sanctuary is trodden down and profaned, and thy priests are in heaviness, and brought low. 1Mac 3:52 And lo, the heathen are assembled together against us to destroy us: what things they imagine against us, thou knowest. 1Mac 3:53 How shall we be able to stand against them, except thou, O God, be our help? 1Mac 3:54 Then sounded they with trumpets, and cried with a loud voice. 1Mac 3:55 And after this Judas ordained captains over the people, even captains over thousands, and over hundreds, and over fifties, and over tens. 1Mac 3:56 But as for such as were building houses, or had betrothed wives, or were planting vineyards, or were fearful, those he commanded that they should return, every man to his own house, according to the law. 1Mac 3:57 So the camp removed, and pitched upon the south side of Emmaus. 1Mac 3:59 For it is better for us to die in battle, than to behold the calamities of our people and our sanctuary. 1Mac 3:60 Nevertheless, as the will of God is in heaven, so let him do. 1Mac 4:2 To the end he might rush in upon the camp of the Jews, and smite them suddenly. And the men of the fortress were his guides. 1Mac 4:4 While as yet the forces were dispersed from the camp. 1Mac 4:6 But as soon as it was day, Judas shewed himself in the plain with three thousand men, who nevertheless had neither armour nor swords to their minds. 1Mac 4:7 And they saw the camp of the heathen, that it was strong and well harnessed, and compassed round about with horsemen; and these were expert of war. 1Mac 4:8 Then said Judas to the men that were with him, Fear ye not their multitude, neither be ye afraid of their assault. 1Mac 4:9 Remember how our fathers were delivered in the Red sea, when Pharaoh pursued them with an army. 1Mac 4:11 That so all the heathen may know that there is one who delivereth and saveth Israel. 1Mac 4:12 Then the strangers lifted up their eyes, and saw them coming over against them. 1Mac 4:13 Wherefore they went out of the camp to battle; but they that were with Judas sounded their trumpets. 1Mac 4:14 So they joined battle, and the heathen being discomfited fled into the plain. 1Mac 4:15 Howbeit all the hindmost of them were slain with the sword: for they pursued them unto Gazera, and unto the plains of Idumea, and Azotus, and Jamnia, so that there were slain of them upon a three thousand men. 1Mac 4:18 And Gorgias and his host are here by us in the mountain: but stand ye now against our enemies, and overcome them, and after this ye may boldly take the spoils. 1Mac 4:22 They fled every one into the land of strangers. 1Mac 4:23 Then Judas returned to spoil the tents, where they got much gold, and silver, and blue silk, and purple of the sea, and great riches. 1Mac 4:24 After this they went home, and sung a song of thanksgiving, and praised the Lord in heaven: because it is good, because his mercy endureth forever. 1Mac 4:25 Thus Israel had a great deliverance that day. 1Mac 4:27 Who, when he heard thereof, was confounded and discouraged, because neither such things as he would were done unto Israel, nor such things as the king commanded him were come to pass. 1Mac 4:28 The next year therefore following Lysias gathered together threescore thousand choice men of foot, and five thousand horsemen, that he might subdue them. 1Mac 4:29 So they came into Idumea, and pitched their tents at Bethsura, and Judas met them with ten thousand men. 1Mac 4:33 Cast them down with the sword of them that love thee, and let all those that know thy name praise thee with thanksgiving. 1Mac 4:34 So they joined battle; and there were slain of the host of Lysias about five thousand men, even before them were they slain. 1Mac 4:35 Now when Lysias saw his army put to flight, and the manliness of Judas' soldiers, and how they were ready either to live or die valiantly, he went into Antiochia, and gathered together a company of strangers, and having made his army greater than it was, he purposed to come again into Judea. 1Mac 4:36 Then said Judas and his brethren, Behold, our enemies are discomfited: let us go up to cleanse and dedicate the sanctuary. 1Mac 4:37 Upon this all the host assembled themselves together, and went up into mount Sion. 1Mac 4:40 And fell down flat to the ground upon their faces, and blew an alarm with the trumpets, and cried toward heaven. 1Mac 4:41 Then Judas appointed certain men to fight against those that were in the fortress, until he had cleansed the sanctuary. 1Mac 4:43 Who cleansed the sanctuary, and bare out the defiled stones into an unclean place. 1Mac 4:46 And laid up the stones in the mountain of the temple in a convenient place, until there should come a prophet to shew what should be done with them. 1Mac 4:48 And made up the sanctuary, and the things that were within the temple, and hallowed the courts. 1Mac 4:49 They made also new holy vessels, and into the temple they brought the candlestick, and the altar of burnt offerings, and of incense, and the table. 1Mac 4:50 And upon the altar they burned incense, and the lamps that were upon the candlestick they lighted, that they might give light in the temple. 1Mac 4:51 Furthermore they set the loaves upon the table, and spread out the veils, and finished all the works which they had begun to make. 1Mac 4:53 And offered sacrifice according to the law upon the new altar of burnt offerings, which they had made. 1Mac 4:54 Look, at what time and what day the heathen had profaned it, even in that was it dedicated with songs, and citherns, and harps, and cymbals. 1Mac 4:55 Then all the people fell upon their faces, worshipping and praising the God of heaven, who had given them good success. 1Mac 4:56 And so they kept the dedication of the altar eight days and offered burnt offerings with gladness, and sacrificed the sacrifice of deliverance and praise. 1Mac 4:57 They decked also the forefront of the temple with crowns of gold, and with shields; and the gates and the chambers they renewed, and hanged doors upon them. 1Mac 4:58 Thus was there very great gladness among the people, for that the reproach of the heathen was put away. 1Mac 4:59 Moreover Judas and his brethren with the whole congregation of Israel ordained, that the days of the dedication of the altar should be kept in their season from year to year by the space of eight days, from the five and twentieth day of the month Casleu, with mirth and gladness. 1Mac 4:60 At that time also they builded up the mount Sion with high walls and strong towers round about, lest the Gentiles should come and tread it down as they had done before. 1Mac 4:61 And they set there a garrison to keep it, and fortified Bethsura to preserve it; that the people might have a defence against Idumea. 1Mac 5:1 Now when the nations round about heard that the altar was built and the sanctuary renewed as before, it displeased them very much. 1Mac 5:2 Wherefore they thought to destroy the generation of Jacob that was among them, and thereupon they began to slay and destroy the people. 1Mac 5:3 Then Judas fought against the children of Esau in Idumea at Arabattine, because they besieged Gael: and he gave them a great overthrow, and abated their courage, and took their spoils. 1Mac 5:4 Also he remembered the injury of the children of Bean, who had been a snare and an offence unto the people, in that they lay in wait for them in the ways. 1Mac 5:5 He shut them up therefore in the towers, and encamped against them, and destroyed them utterly, and burned the towers of that place with fire, and all that were therein. 1Mac 5:6 Afterward he passed over to the children of Ammon, where he found a mighty power, and much people, with Timotheus their captain. 1Mac 5:7 So he fought many battles with them, till at length they were discomfited before him; and he smote them. 1Mac 5:8 And when he had taken Jazar, with the towns belonging thereto, he returned into Judea. 1Mac 5:9 Then the heathen that were at Galaad assembled themselves together against the Israelites that were in their quarters, to destroy them; but they fled to the fortress of Dathema. 1Mac 5:11 And they are preparing to come and take the fortress whereunto we are fled, Timotheus being captain of their host. 1Mac 5:13 Yea, all our brethren that were in the places of Tobie are put to death: their wives and their children also they have carried away captives, and borne away their stuff; and they have destroyed there about a thousand men. 1Mac 5:15 And said, They of Ptolemais, and of Tyrus, and Sidon, and all Galilee of the Gentiles, are assembled together against us to consume us. 1Mac 5:16 Now when Judas and the people heard these words, there assembled a great congregation together, to consult what they should do for their brethren, that were in trouble, and assaulted of them. 1Mac 5:17 Then said Judas unto Simon his brother, Choose thee out men, and go and deliver thy brethren that are in Galilee, for I and Jonathan my brother will go into the country of Galaad. 1Mac 5:18 So he left Joseph the son of Zacharias, and Azarias, captains of the people, with the remnant of the host in Judea to keep it. 1Mac 5:19 Unto whom he gave commandment, saying, Take ye the charge of this people, and see that ye make not war against the heathen until the time that we come again. 1Mac 5:20 Now unto Simon were given three thousand men to go into Galilee, and unto Judas eight thousand men for the country of Galaad. 1Mac 5:21 Then went Simon into Galilee, where he fought many battles with the heathen, so that the heathen were discomfited by him. 1Mac 5:22 And he pursued them unto the gate of Ptolemais; and there were slain of the heathen about three thousand men, whose spoils he took. 1Mac 5:23 And those that were in Galilee, and in Arbattis, with their wives and their children, and all that they had, took he away with him, and brought them into Judea with great joy. 1Mac 5:27 And that they were shut up in the rest of the cities of the country of Galaad, and that against to morrow they had appointed to bring their host against the forts, and to take them, and to destroy them all in one day. 1Mac 5:29 From whence he removed by night, and went till he came to the fortress. 1Mac 5:30 And betimes in the morning they looked up, and, behold, there was an innumerable people bearing ladders and other engines of war, to take the fortress: for they assaulted them. 1Mac 5:32 He said unto his host, Fight this day for your brethren. 1Mac 5:33 So he went forth behind them in three companies, who sounded their trumpets, and cried with prayer. 1Mac 5:34 Then the host of Timotheus, knowing that it was Maccabeus, fled from him: wherefore he smote them with a great slaughter; so that there were killed of them that day about eight thousand men. 1Mac 5:35 This done, Judas turned aside to Maspha; and after he had assaulted it he took and slew all the males therein, and received the spoils thereof and and burnt it with fire. 1Mac 5:36 From thence went he, and took Casphon, Maged, Bosor, and the other cities of the country of Galaad. 1Mac 5:37 After these things gathered Timotheus another host and encamped against Raphon beyond the brook. 1Mac 5:38 So Judas sent men to espy the host, who brought him word, saying, All the heathen that be round about us are assembled unto them, even a very great host. 1Mac 5:39 He hath also hired the Arabians to help them and they have pitched their tents beyond the brook, ready to come and fight against thee. Upon this Judas went to meet them. 1Mac 5:41 But if he be afraid, and camp beyond the river, we shall go over unto him, and prevail against him. 1Mac 5:42 Now when Judas came near the brook, he caused the scribes of the people to remain by the brook: unto whom he gave commandment, saying, Suffer no man to remain in the camp, but let all come to the battle. 1Mac 5:43 So he went first over unto them, and all the people after him: then all the heathen, being discomfited before him, cast away their weapons, and fled unto the temple that was at Carnaim. 1Mac 5:44 But they took the city, and burned the temple with all that were therein. Thus was Carnaim subdued, neither could they stand any longer before Judas. 1Mac 5:45 Then Judas gathered together all the Israelites that were in the country of Galaad, from the least unto the greatest, even their wives, and their children, and their stuff, a very great host, to the end they might come into the land of Judea. 1Mac 5:46 Now when they came unto Ephron, (this was a great city in the way as they should go, very well fortified) they could not turn from it, either on the right hand or the left, but must needs pass through the midst of it. 1Mac 5:47 Then they of the city shut them out, and stopped up the gates with stones. 1Mac 5:48 Whereupon Judas sent unto them in peaceable manner, saying, Let us pass through your land to go into our own country, and none shall do you any hurt; we will only pass through on foot: howbeit they would not open unto him. 1Mac 5:49 Wherefore Judas commanded a proclamation to be made throughout the host, that every man should pitch his tent in the place where he was. 1Mac 5:51 Who then slew all the males with the edge of the sword, and rased the city, and took the spoils thereof, and passed through the city over them that were slain. 1Mac 5:52 After this went they over Jordan into the great plain before Bethsan. 1Mac 5:53 And Judas gathered together those that came behind, and exhorted the people all the way through, till they came into the land of Judea. 1Mac 5:54 So they went up to mount Sion with joy and gladness, where they offered burnt offerings, because not one of them were slain until they had returned in peace. 1Mac 5:56 Joseph the son of Zacharias, and Azarias, captains of the garrisons, heard of the valiant acts and warlike deeds which they had done. 1Mac 5:57 Wherefore they said, Let us also get us a name, and go fight against the heathen that are round about us. 1Mac 5:58 So when they had given charge unto the garrison that was with them, they went toward Jamnia. 1Mac 5:59 Then came Gorgias and his men out of the city to fight against them. 1Mac 5:60 And so it was, that Joseph and Azaras were put to flight, and pursued unto the borders of Judea: and there were slain that day of the people of Israel about two thousand men. 1Mac 5:61 Thus was there a great overthrow among the children of Israel, because they were not obedient unto Judas and his brethren, but thought to do some valiant act. 1Mac 5:62 Moreover these men came not of the seed of those, by whose hand deliverance was given unto Israel. 1Mac 5:64 Insomuch as the the people assembled unto them with joyful acclamations. 1Mac 5:65 Afterward went Judas forth with his brethren, and fought against the children of Esau in the land toward the south, where he smote Hebron, and the towns thereof, and pulled down the fortress of it, and burned the towers thereof round about. 1Mac 5:66 From thence he removed to go into the land of the Philistines, and passed through Samaria. 1Mac 5:67 At that time certain priests, desirous to shew their valour, were slain in battle, for that they went out to fight unadvisedly. 1Mac 5:68 So Judas turned to Azotus in the land of the Philistines, and when he had pulled down their altars, and burned their carved images with fire, and spoiled their cities, he returned into the land of Judea.